Now this is an obvious one. Lifting weights puts stress on the body allowing it to grow and get stronger. Having a strong body makes everyday life easier as it will take less effort to do things such as stand up, lift boxes, go up the stairs, etc. Plus, you will be adding lean muscle to your body and you will start looking better than ever! 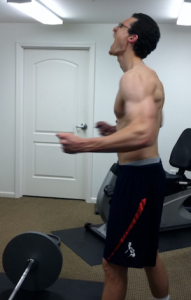 Lifting builds strong muscles, tendons, and ligaments which will make it less likely for you to get injured. Injuries happen when something in our body is weak or overused. By strengthening our bodies and the muscles around joints and ligaments, we are preventing injuries that may have happened if we hadn’t been lifting. Many times when I hear people complain about back and knee pain it is simply because the muscles around those areas are weak. Having strong quads, hamstrings, back muscles, and glutes will help eliminate your back and knee problems. Strength training boosts your metabolism which means you will burn more fat and calories even after your workouts are over. At times the scale may say you are not “losing weight”, but in reality you are burning fat and replacing it will lean muscle. Lifting weights will make you look thinner, more fit, and ultimately get you ripped! 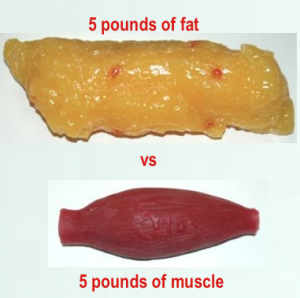 Fat takes up much more room than muscle! Strength training brings results, period. And the more results you see the more confidence you start to have. If you can push through the first three weeks of training, your confidence will continue to soar as you start seeing more and more results. Accomplishing goals is always a great way to build confidence. When it comes to strength training, you can continually be going after new goals whether that be: lifting more weight that the day before, doing more reps, losing fat, gaining muscle, beating a friend in the weight room, etc. Set goals, go after them, and accomplish them. Studies have shown that regular exercise is one of the three best tools in stress management. Research suggests that those who train regularly are less affected by the stress they face in their daily lives. In short, weight training can help eliminate the future stress you face and enable you to cope with your current stresses. Strength training has been shown to bring a better nights rest by allowing you to fall asleep faster and fall into a deeper sleep. Sleep allows your body to recover which is needed when lifting weights. Plus, we all know the importance of a good nights sleep so it’s a win win situation! Not only will strength training develop your muscles but it will also improve balance, coordination, and posture. Stronger muscles will help you stand and sit straighter as well as increase your stability in all you do. When you strength train, you elevate your level of endorphins (which are natural opiates produced by the brain) making you feel great about yourself and life! Weight training has been shown to be a natural antidepressant and will improve your overall quality of life. I would love to hear your feedback below! P.S. If you liked this post, could you please “Like”, “Tweet”, and +1 it! P.P.S. If you haven’t already, be sure to check out the awesome free gift I have for you! Don't Be Misled By What You See! Are You Afraid To Get Strong? Hey there, You have done a fantastic job. I’ll certainly digg it and personally suggest to my friends. I’m sure they’ll be benefited from this site.